Keiko has never really fitted in. At school and university people find her odd and her family worries she'll never be normal. To appease them, Keiko takes a job at a newly opened convenience store. Here, she finds peace and purpose in the simple, daily tasks and routine interactions. She is, she comes to understand, happiest as a convenience store worker. But in Keiko's social circle it just won't do for an unmarried woman to spend all her time stacking shelves and re-ordering green tea. 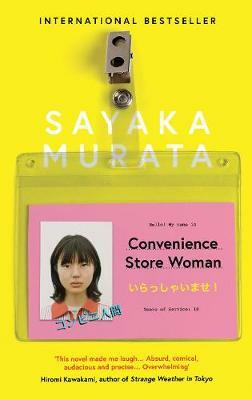 As pressure mounts on Keiko to find either a new job, or worse, a husband, she is forced to take desperate action... A best-seller in Japan, and the winner of the prestigious Akutagawa Prize, Convenience Store Woman marks the English-language debut of a writer who has been hailed as the most exciting voice of her generation. One of the most celebrated of the new generation of Japanese writers, Sayaka Murata has won not only the prestigious Akutagawa Prize, but the Gunzo, Noma, and Mishima Yukio Prizes as well. Her story, 'A Clean Marriage', was featured in Granta 127 Japan. She is 36-years-old and works part-time in a convenience store. Ginny Tapley Takemori has translated Ryu Murakami, Miyabe Miyuki, Akiyuki Nosaka, and Kyotaro Nishimura, among others. Her translation of Tomiko Inui's The Secret of the Blue Glass was shortlisted for the Marsh Award. This is a brilliant book, blackly funny, and very contemporary. I bought it for a colleague who is a Japanophile. She loved it and carried it round with her, which is testament to how compelling is the story. I devoured it in a couple of sittings too. It’s a condensed jewel of a story about a woman who works in a convenience store; she’s been there so long she feels she is part of the furniture. She has some issues with life, and customers, and shopping. She “heat treats” her food rather than cooking it, and views marriage as an interesting idea which her colleagues are driving her towards. What happens when she meets a potential suitor in the store is hilarious. Thanks to Foyles for bringing this book to my attention through its literature of Japan display. Offbeat and quirky, this gem of a novel is a treasure to anyone who has ever felt a little odd! Sayaka Murata manages to balance light humour with a quiet poignancy and I urge you—if you’ve ever felt the burden of expectation, or just found the world around you a bit strange sometimes—to pick up this book! You won’t be disappointed. Keiko can be strange. A litany of incidents as a small child sets her apart from most of her friends and fills her with anxiousness. When she grows up, she stumbles into a job working in a convenience store... and she has been there ever since. Finding comfort in the mundane, the perpetuity of the day to day and always being the model employee bring much joy to her heart. But is this enough? Friends and family worry and feel shamed by her, some suggesting marriage maybe the answer, and escape. Question is, does Keiko want to escape and could she survive if she did? This is quirky, sweet but slightly unsettling story about doing something that you love, and the traps one falls into when the the easy path is all too tempting.